Performance run time is approximately 2 hours and 15 minutes, including one 15-minute intermission. 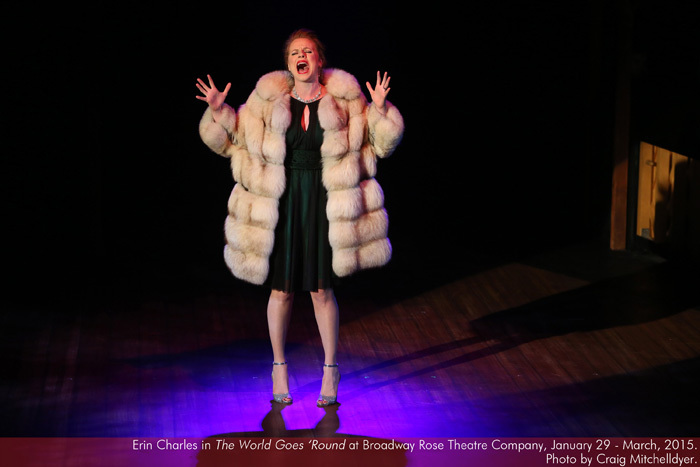 Erin Charles is so happy to be back at Broadway Rose! Previous shows here include Band Geeks!, Celebrate Home, and Honky Tonk Angels. Other Portland credits include Belle in Disney’s Beauty and The Beast, Dorothy in The Wizard of Oz, Vivienne in Legally Blonde (Pixie Dust Productions), Queenie in The Wild Party (Live On Stage), Witch in Into The Woods (Lakewood Theatre), Heidi in [title of show], Mary Lane in Reefer Madness, and Nellie in Floyd Collins (Stumptown Stages). When not on stage Erin enjoys working as a secretary in an elementary school and spending time with her modern family. 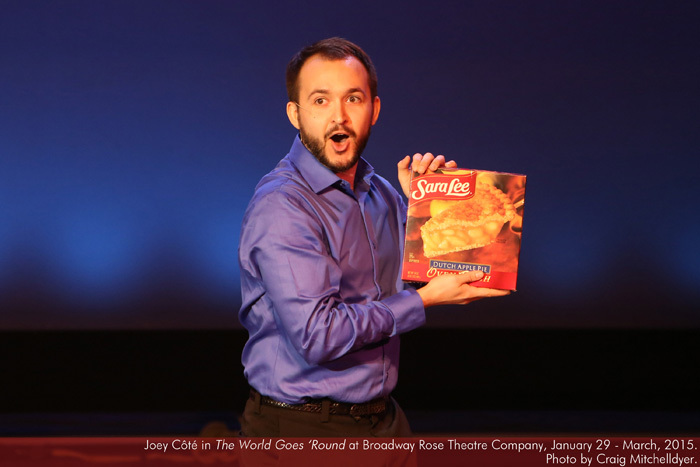 Joey Côté is thrilled to be returning to Broadway Rose in The World Goes ‘Round. Previous appearances here include Dopey in Snow White, Troubadour in Cinderella, and Ewart Dunlop (one of the barbershopping school board members) in The Music Man. Joey has also had the honor and pleasure of working with Dan Murphy onstage as LeFou in Disney’s Beauty and the Beast (Pixie Dust Productions). Recent performances in the area include Dad/Booger in Ivy + Bean (Oregon Children’s Theatre), Francis in La Cage aux Folles (Pixie Dust Productions), and Ensemble in Spamalot (Lakewood Theatre). 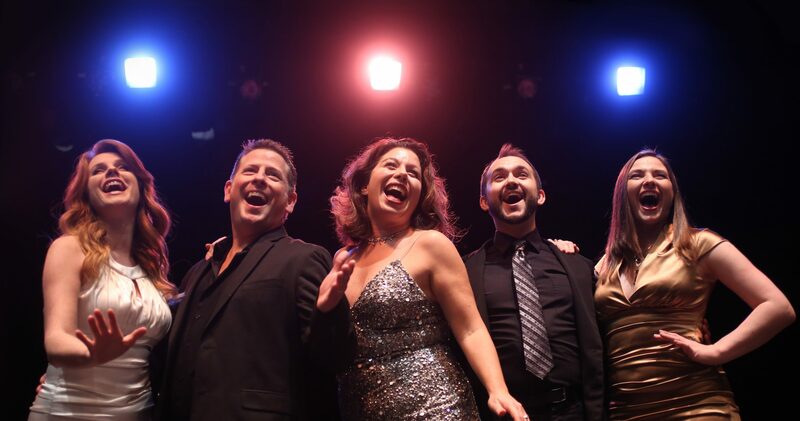 Joey is very thankful for this wonderful opportunity to perform the beautiful classics of John Kander and Fred Ebb with this talented musical theater ensemble. 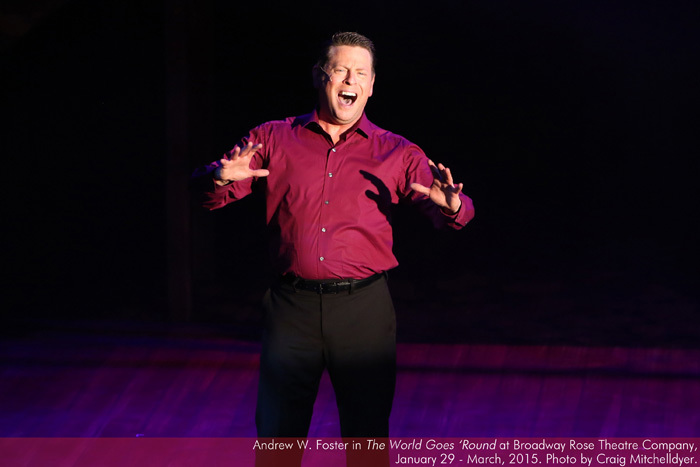 Andrew W. Foster is thrilled to be making his second Broadway Rose appearance working with this dynamic cast! He was last seen on stage at Broadway Rose as Sal in Nite Club Confidential. Other favorite roles include Bobby in Company, Jesus in Godspell, Mike in A Chorus Line, and numerous other productions playing 4th spear carrier from the left. Jennifer Goldsmith You might remember Jennifer from last season on the Broadway Rose stage in the quiet and demure role of Liddy Allen, the cockney maid in Whodunit…The Musical. Other favorite roles locally include Lottie in Enchanted April at Artists Repertory Theatre, Franca Nacarelli (Drammy Award) in Light in the Piazza at Portland Playhouse, Georgie in The Full Monty at Lakewood Theater Company, all the adult women’s roles in Spring Awakening at Live On Stage, and Trina (Drammy Award) in Falsettos and Babs Streisand, Ethel Merman, Edith Piaf, et al. 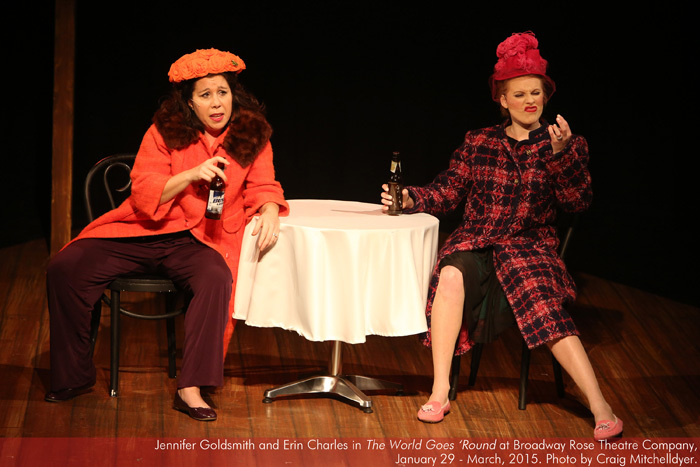 (Drammy Award) in Forbidden Broadway both for Triangle Productions. Regional roles that she had the privilege to play include Fanny Brice in Funny Girl, Sally Bowles in Cabaret, Judas Iscariot in Jesus Christ Superstar, and Bakers’s Wife in Into the Woods. She has toured nationally with the Young People’s Theatre Project as well as singing up and down the Mississippi River with the Delta Queen Steamboat Company. When not on stage, she is back stage working as the Associate Development Director for Portland Center Stage. 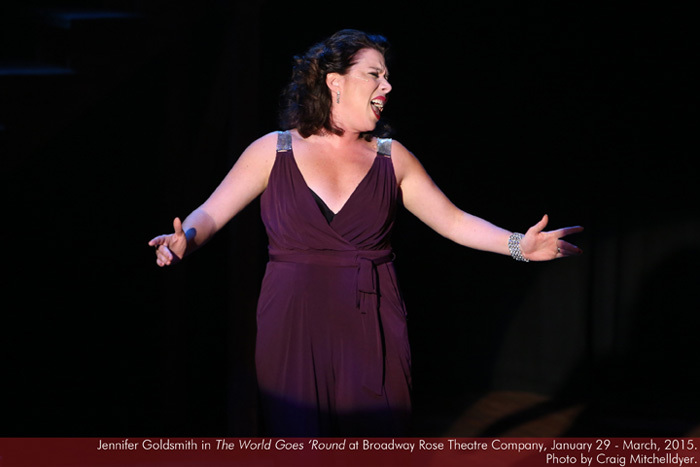 Ecaterina Lynn is thrilled to be returning to Broadway Rose to be part of The World Goes ‘Round. Originally from Colorado with a Bachelor’s degree in Musical Theater from Oklahoma City University, she has happily settled in Portland. Recent productions include Rocky Horror Show with Live On Stage, Disney’s Beauty and the Beast with Pixie Dust Productions, and The Best Little Whorehouse in Texas, Lucky Stiff, and Cats with Broadway Rose. She has also appeared in White Christmas, Mr. President, South Pacific, and City of Angels with Lakewood Theatre. Favorite roles include Sally Bowles in Cabaret, Bianca in Kiss Me Kate, and Judy Haynes in White Christmas. Concert work includes guest solos with The Emerald City Jazz Kings, Mason Williams, Ian Whitcomb, EVAE, ECC and others. 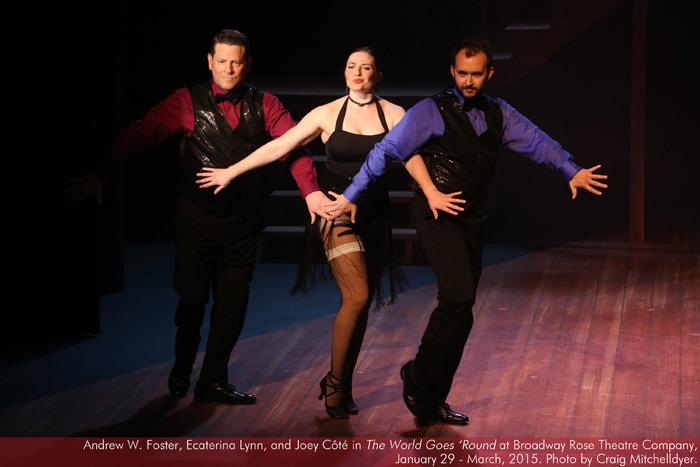 The current production of The World Goes ‘Round is a celebration of the works of John Kander and Fred Ebb (think Chicago, Cabaret, Kiss of the Spider Woman and several iconic songs we didn’t even realize were taken from musicals). 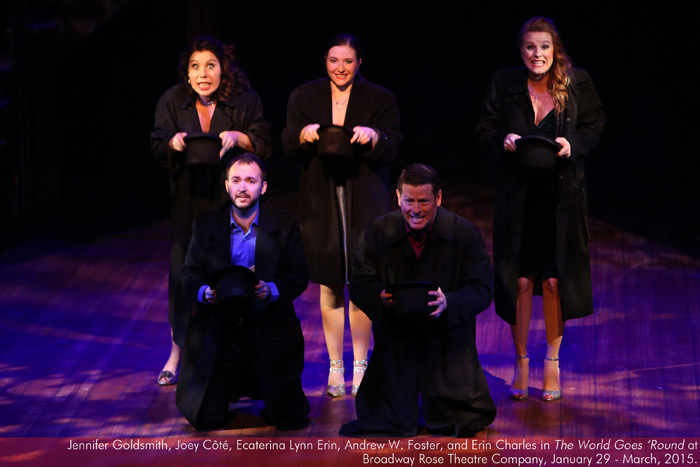 It is quite wonderful…Both cast and band are beautifully suited to the demands of Kander and Ebb’s most powerful, best-known works interspersed with a less familiar body of quaintly romantic ballads and novelty songs…Read more. 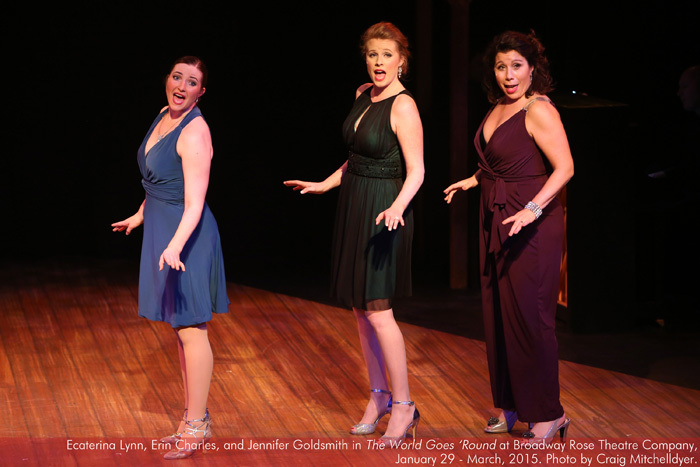 Dan Murphy’s Director’s Note reveals that he was unfamiliar with most of the songs in The World Goes ‘Round when he saw the New York production, and that prior knowledge was not required to enjoy it…Read more. 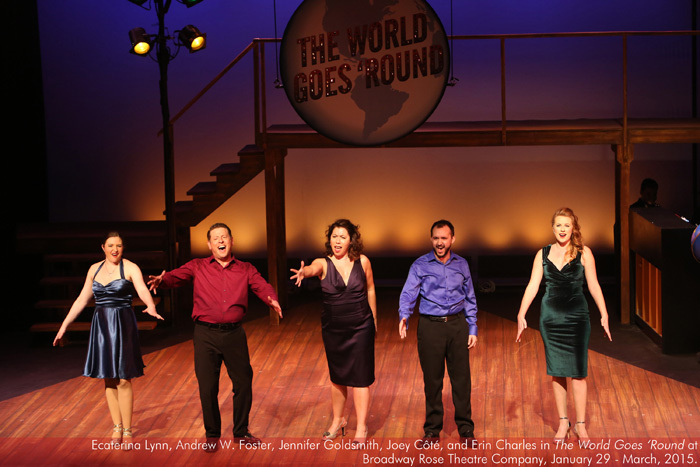 The World Goes ‘Round is a collection of Kander and Ebb’s best songs, one after another, some shading into each other, others standing apart, presented by a cast of five and a band of five, every one of whom is determined to entertain you like you’ve never been entertained before. They’re all up to the intense energy of Kander and Ebb’s work, which demands that a performer have incredible stamina, impeccable timing, and several pairs of dancing shoes…Read more. 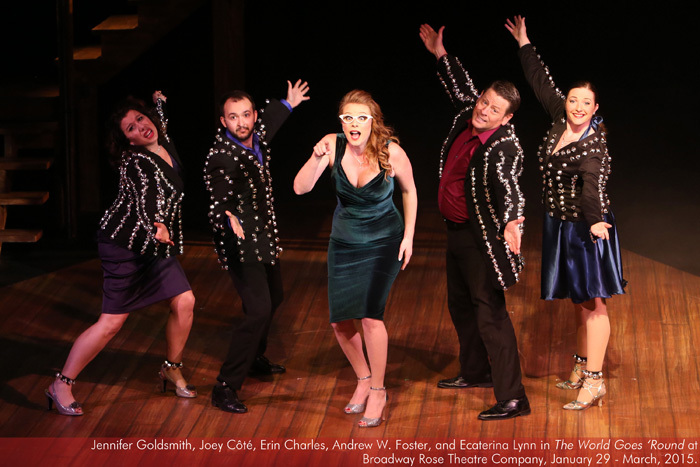 Jennifer Goldsmith lives, eats and breathes theater: Her day job is working at Portland Center Stage as the associate development director, and the versatile singer/actress has built up a long resumé appearing in local productions…Read more.